There are almost as many laptops as there are rifles scattered around the 2nd Squad's sleeping quarters in the old school at Combat Outpost (COP) Kowall. Mixed in with dust, sand, helmets and 40-mm grenades are Dells and MacBooks. The men who started out in 2001 as Generation Kill have transformed into Generation iPod. As technology has become miniaturized and more portable, U.S. soldiers have increasingly taken laptops, terabytes of movies and video-game systems into war zones to kill downtime. Private First Class Andrew Napoli, 21, took a BlackBerry, a MacBook, an iPad, a PlayStation Portable video-game system, a terabyte external hard drive and a cell phone to Kandahar province's Arghandab River Valley when he was deployed in August 2010 with the 3rd Platoon of Alpha Company, 1st Battalion, 66th Armored Regiment, 2nd Brigade Combat Team of the 4th Infantry Division. Napoli says he spends a majority of his time on guard duty or foot patrol. Now there is less fighting, he says, he sometimes watches two or three movies a day. It was a different situation last summer. For three months, from August to October last year, the newly arrived soldiers of the 3rd Platoon at COP Kowall were hit by Taliban fighters multiple times per day; foot patrols had frequent contact with the enemy. "There was no sleep, no nothing besides patrols, firefights and guard duty," Napoli says. Now, fighting has given way to boredom and routine as the troop surge has brought more stability to the valley. Surrounded by high walls and barbwire in a battle zone that was once one of the most violent in Afghanistan means there is not a lot to do besides guard, patrol and sleep. But that is the old Army. Now soldiers can watch movies on laptops and chat with friends online. "All there is to do here is watch movies and play video games in your free time. It's nice for a couple hours to just take your mind out of here. No matter what else you do: you're working out, you're still at the gym at this COP; you play video games, you're still playing video games at the COP. But a movie is nice because you can just kind of sit there. There have been times when I'd hang a sheet over my bunk bed and sit there and watch a movie. Sometimes you'd forget where you are and you'd pull back the sheet and be like, 's--t, I'm still here,'" Napoli tells TIME. A majority of the soldiers in the platoon brought laptops  anticipating the monotony of counterinsurgency warfare. "I kind of bought this laptop special for the tour because I knew it'd get destroyed. I didn't want to buy a nice one, so just got a $300 one," says Private First Class Sheldon Henry as he watches a crime drama between patrols. "If they didn't have their laptops?" says Sergeant Byren Gerber, the 2nd Squad's leader, "they'd probably get in fights." The eyes of Private First Class Greg Diette, who watches around 20 movies a week, open wide when he contemplates the question of what he would do without a laptop. "If I didn't have it?" he says, pausing. "No idea." But laptops, movies, video games and iPods are not the only escapes. BlackBerrys have made an appearance in the combat zone as well. Of the roughly 30 soldiers in the platoon, five of them have the devices (the soldiers pay the monthly charges themselves). Napoli says he uses his "everyday. All day." Napoli's wife sent the device to him so they could stay in touch. "My wife updates me on her life. I listen mostly because my daily life doesn't change basically. But we'll send each other pictures once in a while so that we see each other in some sort of way," he says. But, even with all of the communications devices and ways to keep in touch, Napoli says that during the heavy fighting last year he did not tell his family what was happening. "My wife knows stuff happens. They're following the news, but if they would hear about it from me, they would think, 'O.K., that's really bad.'" The view that less information about the fighting is better is shared by most of the other soldiers. 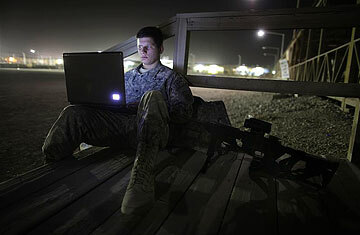 "I've never posted anything like, 'Oh, another firefight,' on Facebook," Private First Class Juan Lopez, 20, tells TIME. Even if they do not do a live update on firefights, with all of the communications options out there  from Skype to Google Talk to AIM  it has become easier and easier to stay in constant touch. But this can present drawbacks  and dangers  in a war zone. "I'm really attached to my family. At one point, I would call home just about every other day. I started getting homesick, and I felt like it was interfering with my work. I'd be on patrol, and then I'd catch myself thinking about my mother and my father or my sisters, my nieces and nephews  just not paying attention to what's in front of me. So, I just quit calling home as much," says Lopez. Now, Lopez's family follows him on Facebook, reading his status updates  a way to stay in touch with less emotional commitment. Other soldiers feel similar about all the methods they can now use to communicate with home. "For me  all this talk while I'm here  I hate it," says Napoli about his BlackBerry. "All the talking I do while I'm here, I don't like it. I'd rather be here the entire year and every once in a while just be like, 'Hey, I'm O.K.' If I didn't have this stuff, I'd be fine with that because I like to focus on my work here and pretend like the life back home doesn't even exist." The older guys in the platoon remember the Army before all of the entertainment and communications options were available  before all of the distractions and news from home. "The only thing we'd get was one 10-minute phone call a week," says Staff Sergeant John Fox, 32, of his deployment to Iraq in 2003. There were no public computer terminals available to the soldiers. Fox, who had his wife set up a Yahoo! Messenger account for him just days before this deployment, says there were "probably about three or four guys who brought out laptops" to Iraq in 2003. "It was just a bunch of guys all huddled around one laptop watching pirated DVDs." Yet, even with all of the changes that have taken place in the past decade  the vast increase in interconnectedness, communications options and social-networking sites  troops, young and old alike, still agree that the traditional letter to a soldier still carries the most weight. "To me, a letter goes a long way. Nowadays it'll mean a lot more because somebody actually took the time out of their day to sit down and write," says Lopez, who has an ammo can full of saved letters. "A letter takes more time out of your day. E-mails and messages on Facebook, or anything like that, you do it on your phone. You know, you're sitting there while you're driving and you can send a text or whatever. But a letter, you have to write it, you have to wait for it." See pictures of President Obama in Afghanistan. See the 100 gadgets of all-TIME.